There's more than one Bolivia missionary who is blogging. Over 9 million people live in the South American country of Bolivia, both rich and poor, both well known and almost forgotten. Officially known as the Republic of Bolivia, it was named after Simón Bolívar, known as a liberator in South America. The Republic was established in 1825. Lets start with our first Bolivia blogger - Homes of Love! We're in Cochabamba in central Bolivia at the Casa de Amor, a children's home. We've been meeting the kids and hearing the stories at this blog since 2008! Let's move on to Santa Cruz de la Sierra, Bolivia, apparently one of the fastest growing cities in the world! The Bremers write - "We are humbled that you are joining us on our journey. It won't always be pretty, but its sure to be an adventure." That's for sure! Their blog is called Bremers in Bolivia - check it out! I should also mention McKinneys to Bolivia. As I write, they are still preparing to go to the field - so stop by and give them some encouragement! Are you a Bolivia missionary? If you're a missionary serving in Bolivia with a blog, please contact me! We would love to meet more of you. Bolivia has three official languages, Spanish, Quechua, and Aymara. 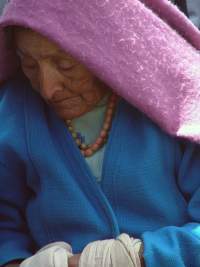 Quechua has been an especially challenging language for missionaries to learn. The Cantuta is the national flower of Bolivia. Want to have some fun learning about Bolivia? Check out this Bolivia trivia!